Gerald (Jerry) Eugene Gaus died on December 24, 2017 due to complications from a fall on River Street, July 2, 2017, Elk Rapids, Michigan. Jerry was 90 years old. He is survived by his wife of 65 years, Helen (Jeanie) Morrison Gaus of Elk Rapids and daughters, Cheryl Gaus of Dover, New Hampshire and Elizabeth Gaus (Joel) Otting of Chandler, Arizona. Jerry was born on September 27, 1927 to Charles F. Gaus and Laura Frances (Leap) Gaus in Anderson, Indiana. At that time, the family already had a 100+ year history in this Midwest community. Jerry was as at home on the factory floor where he spent 35+ years working for the Delco Remy division of General Motors, as he was discussing world affairs with an acquaintance at the post office. After graduating from Anderson High School, Jerry entered Delco's first apprentice program, at the age of 17; Classes were 50 cents each! His hard work and persistence, eventually lead to his becoming Foreman of the Model Shop, a position he held throughout the later part of his career. At 18, Jerry was drafted but as WWII had just ended, he was given the "opportunity" to become an enlisted man. Not surprising, soon after he was shipped overseas, Jerry found himself managing the enlisted men's club in Mainz, Germany. The fact he was underage, didn't seem to hinder his ability to procure and sell liquor at a profit. Jerry's life experiences were exhaustive which made it easy for him to relate to those whose lives he touched. A conversation with Jerry, left one feeling good about one's self and positive about life in general! While working for Delco Remy, Jerry simultaneously ran his own insurance business and in his spare time, worked evenings in the hardware department of JCPenney in Anderson. This was back when they sold real hardware. Sales came naturally to Jerry whether it was negotiating crop prices for the farms he and his brother, Charlie, co-owned or, managing the former Elk Rapids Hardware on River Street for three summer seasons; Jerry was candid, honest and knew what you needed! After so many years in Anderson, Jerry and Jeanie moved to Leisure World in Mesa, Arizona. Jerry quickly found seasonal work at the ball park in Scottsdale, where the San Francisco Giants operated their training camp. Jerry embraced the experience, working security, taking tickets, whatever was needed. When asked what was the highlight of this 10 year experience, Jerry replied "The people; it's always about the people you meet." Jerry and Jeanie came full circle when they returned to Elk Rapids, making it their permanent home around 2011. 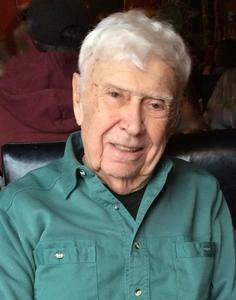 Jerry quickly became a well known and loved figure in town. He and Jeanie walked the Village daily and weather permitting, Jerry rode his bike each morning. In the summer, he and best buddy (and relative) Robert, could be found on the Elk Rapids golf course! Otherwise, he’d be out “supervising” the shrubbery trimming around the condo, with his good friend Stephen. Throughout his life, Jerry put his family first. His sense of humor and ability to give you a "hard time", only endeared him further to those around him. One couldn't help but marvel at this amazing 90 year old who never looked back and reminded all he found sitting, to "...get off your past and on to your future"! In lieu of flowers, Jerry was an ardent supporter of the Wounded Warrior Project so, please send memorials there. Primarily, Jerry would want you to simply take the time to say hello and share a kind word with someone, making their day and yours. The family sends a special thank you to the staff at Munson Hospice House who were exceptional. They ensured, along with the many visits from friends and family, Jerry felt loved and cared for throughout his stay there. Details regarding a celebration of Jerry's life, to be held in Elk Rapids, will be forth coming. Please visit www.lifestorytc.com to sign the guestbook and share your thoughts and memories with the family. The family chose Life Story Funeral Home, Traverse City.